Daniel Alan Isley, 70, of Cullman, passed away Friday, March 22, 2019. Before serving the State of Alabama as an EMA Field Coordinator, Dan was EMA Director of Cullman County. He was a veteran of the United States Army. He is preceded in death by his parents: Edwin and Evelyn Harrison Isley; a sister, Joann Turney and brothers: William and Jerry Isley. Dan is survived by his wife, Tennia Federer Isley; step-daughter, Lori Bates (Nicholas); son, Craig Isley; step-son, Kevin Mooney (Randi); sisters: Jan Burchfield (Randall) and Judy Gamble (Charles); grandchildren: Kaitlyn Mooney and Brayden Mooney; and his constant companion and beloved pet beagle, Elmer. 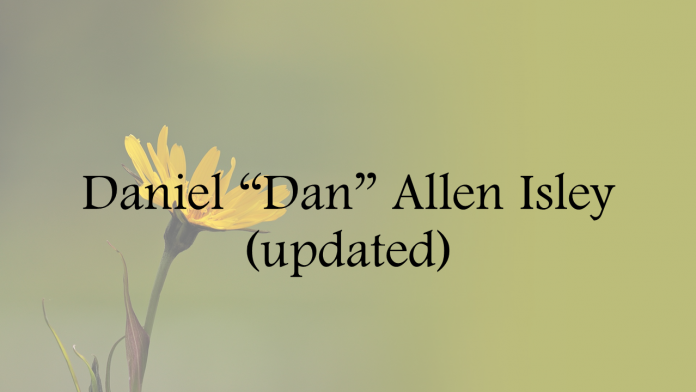 The family will receive friends on Wednesday, March 27, 2019 from 12:30 p.m. until the Celebration of Dan’s Life, which will begin at 2 p.m. at Moss Service Funeral Home Chapel. The family request that in lieu of flowers donations be made to the charity of your choice. Please visit mossservicefh.com to leave condolences for the family. Moss Service Funeral Home directing.